Case Study: Hellman Health & Wellness. Very successful nutritional expert with a history of quality customer loyalty, and positive growth is looking to take their entire game plan to the next level. What is that level you ask? 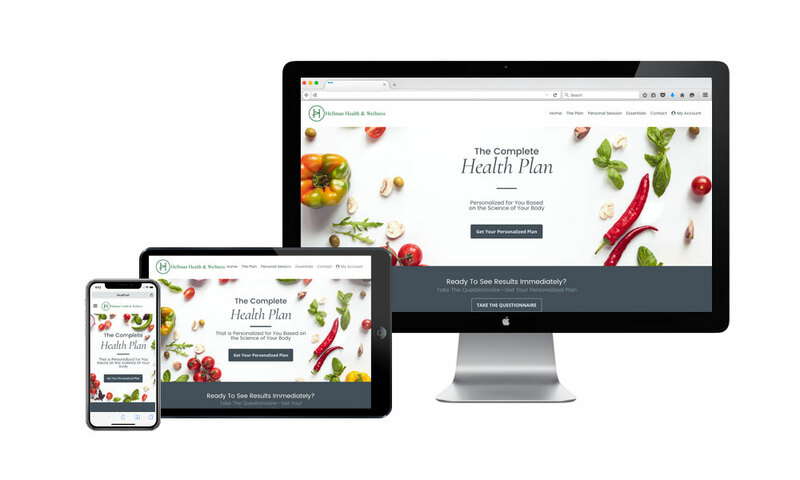 A digitally packaged health & wellness plan that gives folks an personalized, high-quality health & wellness plan to follow. Why is the plan so good? Because it was written by a Certified Nutritionist and Licensed Chef with a well established medical and diet-as-lifestyle background. The plan details out what to eat, when to eat it, what to buy at the grocery store, how to pair foods, suggested recipes, etc. etc. All the components come to a whole using the science of metabolism as a driving force to help people reach their target weight and enjoy lasting good quality of health. The catch…. A quality health report, that doesn’t involve blood work, needs to be driven from a users “BMI number” (Body Mass Index Number) So there is a complex formula needed to find that number, using inputs delivered by the user, and then that number and some other factors will drive what kind of plan a person should follow. And naturally, what documentation they should be delivered through the online portal. Using WordPress, and Gravity Forms Pro, we conjured a glorious user generated system that brings people in, turns them into customers, walks them through their questionnaire and drops them neatly onto their very own custom landing page. Using user-generated “dynamic data” and a customized customer portal, we delivered the exact look, feel and function that we scoped and planned from day one. The sales pages and vanity plate website portal that accompany the assessment portal were all custom styled and organized, outfit with contemporary and 100% custom iconography and graphics, courtesy of our own in-house digital artists. The end result is a beautiful wrapper and educational platform to lead users into the customer registration portal and assessment questionnaire. As an additional but very important element to the work we delivered, we also were brought on to typeset and graphically style the tangible, printable download files. We started with un-styled / unformatted word docs, and worked hand in hand to organize the flow & typesetting of the entire collection. A breath of fresh air and professional styling, thanks to the green light from the executive staff over at Hellman Health & Wellness. We brought the company branding, color schemes, typography, and custom iconography in to all of the user documentation. This process helped refine and detail down the actual meal plans and superlative documentation down to wonderful detail and usability. They got a visual and contextual upgrade on all fronts during the process. A great success by any measure. We are very pleased with final result all made possible because of great client direction, and responsive communications through out the process. For those looking to finally find the right way to eat, and the right way to balance their diet & lifestyle, look no further. Don’t take our word for it, go check out the site. For more information about how we can help your firm build the site or brand package of your dreams, please feel free to contact us.